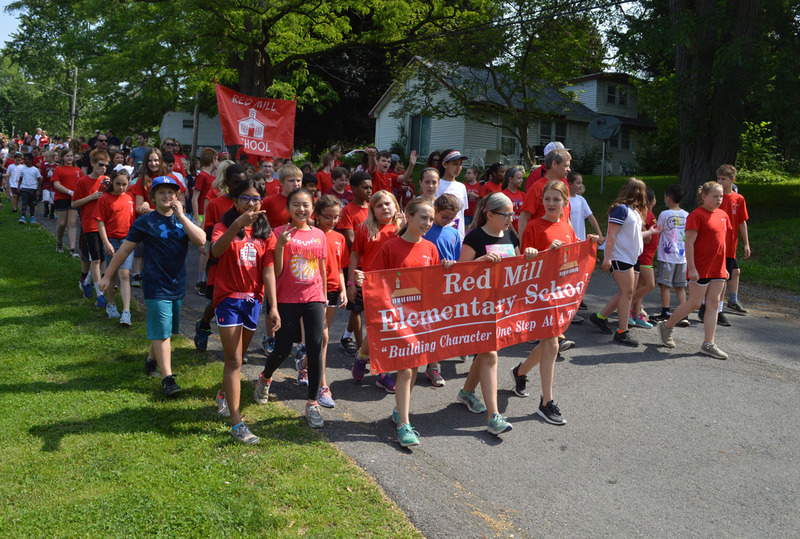 Red Mill showed its school spirit on Friday morning at the 4th annual Character Education Walk. Students were accompanied by teachers and staff, and escorted by the East Greenbush Police Department and Clinton Heights Fire Department, on a one-mile walk around Hampton Manor Lake. Each year, the Character Education Walk supports a charitable cause. This year’s beneficiary is Peppertree Rescue, a local animal shelter that rescues, fosters, and looks to find forever homes for dogs. In total, $1,092.60 was raised for the dog shelter through the generosity of the school community. Special Education teacher Sarah Flannery brought her dog Lucky, who is a Peppertree rescue dog, to the walk. Mrs. Flannery happily shared with the students how Lucky came from a shelter in Tennessee to Peppertree, and finally to his new home with her family. In past years, Red Mill has supported the veteran support group Rebuilding Warriors, the Make-a-Wish Foundation and Mohawk Hudson Humane Society.